Along with making the finest precast forms and molds available, We also specialize in custom fabrication of other products like: hoppers, grizzlies, conveyors, wear plates, tanks, pit frames and covers, platforms, ladders & railings and other items which are ancillary to the precast concrete and construction industries. 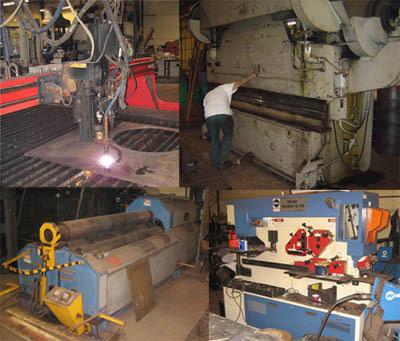 We work in: mild steel, abrasion resistant steel, stainless steel and aluminum. •Automatic and manual saw cut to 18x18"
•Drill holes to 3" diam. •Roll structurals to L4x4x3/4" or L6x6x1/2"